Developer The Howard Hughes Corporation confirms it has acquired the 11.4-acre Macy's store and parking lot, the final piece of the puzzle it needs to begin redeveloping the aging shopping center. WASHINGTON — Just a week after Macy’s said it was closing its Landmark Mall store in Alexandria, developer The Howard Hughes Corporation confirms it has acquired the 11.4-acre Macy’s store and parking lot, the final piece of the puzzle it needs to begin redeveloping the aging shopping center. The developer says it is closing what is left of the mall at the end of January, but has not set a definitive timeline for its redevelopment. Landmark Mall opened in 1965. It has been steadily losing retail tenants in recent years. The Alexandria City Council approved rezoning the property for a massive mixed-use makeover in 2013. 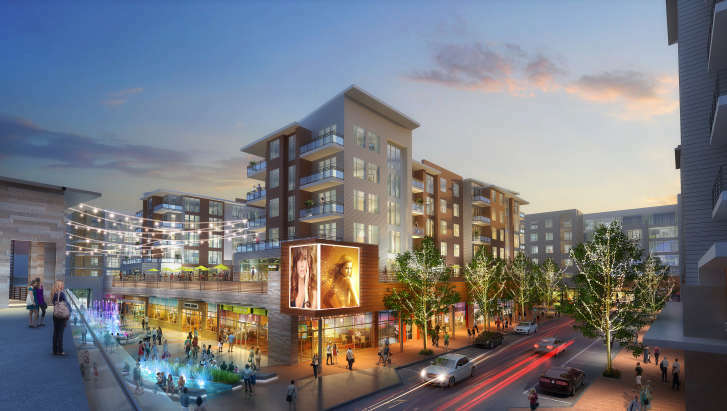 Howard Hughes’ plans include repositioning the property as an open-air, mixed-use community with retail, residential and entertainment components, which the company says will create a dynamic urban village on Alexandria’s west end. The developer says the remake will add multiple plazas and green spaces, outdoor seating, an updated transit center, seasonal entertainment, public art, numerous full-service and fast-casual restaurants and a luxury cinema. “Our vision is to revive the site and create a new urban hub on the west end of Alexandria,” said Mark Bulmash, senior vice president of development for The Howard Hughes Corporation. “This acquisition enables us to increase the scale of this catalytic redevelopment and transform Landmark into a vibrant destination attracting area residents and visitors,” he said. Dallas-based The Howard Hughes Corporation develops commercial and residential projects throughout the country. It has a regional headquarters in Columbia, Maryland.